Upper School is a time for students to explore interests, discover new passions, and delve deeply into topics and activities that are meaningful to them. At St. Mark’s, students participate in all aspects of campus life. Whether in the classroom, the ceramics studio, the journalism suite, or on the playing fields, we encourage students to engage fully in their communities, and by doing so, the communities and the students thrive. We nurture an environment on campus that celebrates striving as well as achieving and provides a place for boys to enjoy boyhood while on their path to manhood. At St. Mark’s we are committed to preparing boys for college and for manhood. Our academic program equips students with content knowledge and skills to ensure their success as they prepare for college; our athletics, fine arts, and clubs program provide the boys with opportunities to explore new interests and to delve deeply into known passions; and, our Character and Leadership Education equips the boys with knowledge and skills to care for their communities and, in turn, to thrive as young men. Each day on campus, our students enjoy meaningful relationships with their peers and their teachers. During the day, you will see Upper School boys playing on the Perot Quadrangle with younger Marksmen, you will see faculty engaged in conversations with small groups of students, and you will see classrooms buzzing with conversation and activity. 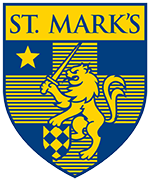 At the core of the St. Mark’s experience is our mission to develop boys into good men. With this mission in mind, we create an environment that allows students to make mistakes, guides boys through adolescence among caring adults, and provides boys with essential skills to take into the future. It is a special place for boys to grow up.